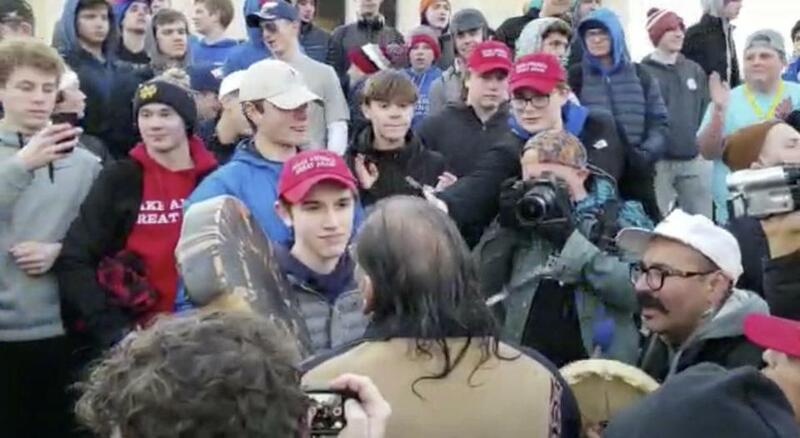 In this Jan. 18 image made from video provided by the Survival Media Agency, a teenager wearing a “Make America Great Again” hat (center left) stands in front of an elderly Native American singing and playing a drum in Washington. Of course, President Trump is defending those smug white teenagers who mocked a Native American man last week at an indigenous people’s march in Washington, D.C.
“Looking like Nick Sandman [sic] & Covington Catholic students were treated unfairly with early judgements [sic] proving out to be false – smeared by media,” Trump tweeted Monday, typos and all. Trump, who smears this country every day, sides with them as a father would shield his own, because that’s exactly what they are. These are the children of Trump’s America. Sandmann, the smirking teen who stared down tribal elder Nathan Phillips, claims he was trying to defuse a heated situation, which included belligerent Black Hebrew Israelites. Or at least that’s the ridiculous spin the PR firm hired by his family is selling, and too many in the media are eagerly buying. It’s such a slab of mendacious nonsense it could have been concocted by White House press secretary Sarah Huckabee Sanders. These teens won’t need to regret anything, not when they have grown folks lining up to give them the benefit of the doubt. Except, there is no doubt. Since the teens are white, they’re being infantilized — which rarely happens for kids of color like Trayvon Martin or Tamir Rice, whose childhood innocence wasn’t assumed before they were shot dead. And, yes, I do equate MAGA gear with traditional Klan attire. The sartorial choices change, the racism remains the same. Those poring over video clips of the disputed confrontation as if they’re missing frames from the Zapruder film want to overlook what’s already clear. Racist adults often start as racist children mimicking the actions they see around them. In this case, it probably started at home, but it’s reinforced by president himself. Trump calls Senator Elizabeth Warren “Pocahontas,” and recently used the Wounded Knee massacre of hundreds of indigenous men, women, and children as a punch line. Since his campaign, Trump’s name has become a epithet that some white people, often in schools, use to intimidate people of color. It’s also now known that Phillips is a Vietnam veteran who served in the Marines. Yet I don’t see those on the right who fetishize the military as a useful prop to impugn the people of color’s patriotism rushing to his defense or demanding an apology on his behalf. To indict these terrible boys, swathes of white America must indict itself, and the racist viciousness they’ve passed on to their children like a warped heirloom. Like Trump, they won’t condemn those MAGA hat hyenas who jeered Phillips as he sang and beat his drum in the shadow of the Lincoln Memorial. Certainly, it doesn’t matter to them that this ugliness unfolded in the place where African-American opera singer Marian Anderson gave a free concert in 1939 after the Daughters of the American Revolution refused to allow a black performer at Constitution Hall. Nor would they recognize the bitter irony that this happened where Martin Luther King Jr., in 1963, offered a still-unfulfilled vision of America, one that recedes further every minute that Trump remains in the White House. James Baldwin once said, “For these are all our children; we will all profit from or pay for whatever they become.” Each day, we pay dearly, and the costs to a nation which imprudently ignores racism and excuses racists becomes exponentially higher. It’s already more than we can afford. What was captured on video in Washington was not a case of “boys being boys.” Instead, it bore witness to the planting of tainted seeds that will become the future Brett Kavanaughs, Stephen Millers, Steve Kings — and Donald Trumps.